Few people know about this small arboretum, which is ideal for a short wheelchair walk within pleasant green parkland. Even long-time Surrey locals have never heard of it. I became aware of it while viewing an online aerial view of the area, when I spotted what appeared to be a gravel footpath, meandering around an area of grassland interspersed with trees. 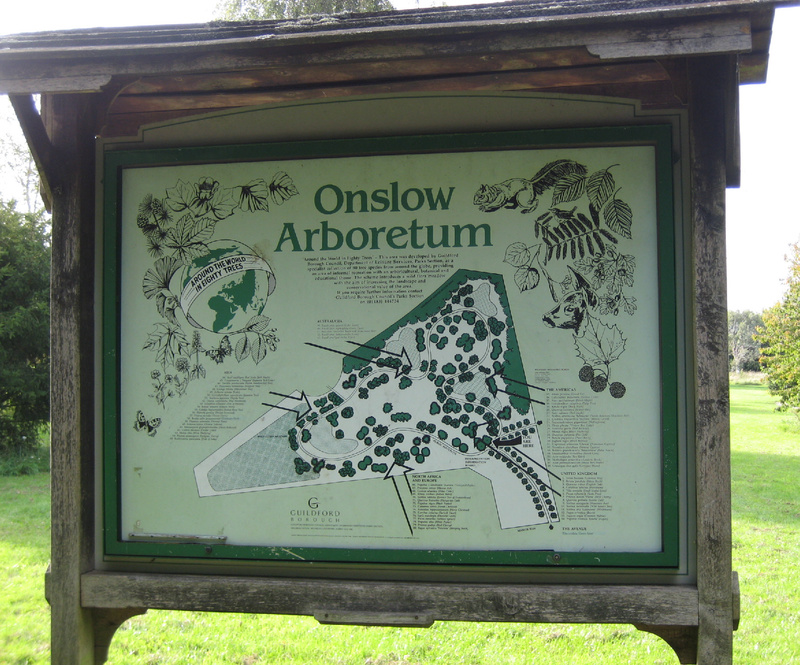 A web search revealed it as Onslow Arboretum, planted in 1995 by Guildford Borough Council following an idea from Merrist Wood College. It’s tucked between Onslow Village and the A3. Themed “Around the World in Eighty Trees”, the tree collection is grouped in areas according to the continents where they originated. An information board with a map is provided at the entrance: this lists the tree species within each continental group but not the location of each specimen. However, you will find each individual tree labelled with its species as you move around the site. 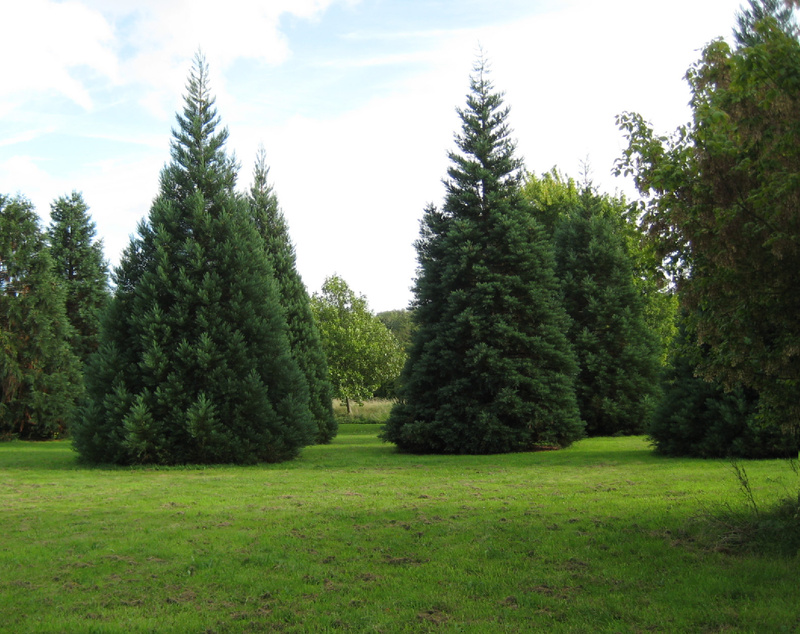 The central area is mown regularly and populated sparingly with ornamental trees including attractive pyramidal conifers. Areas outside the path are left to grow to maturity as self-seeding wildflower meadows. The single path leads off from the information board to either the left or right, taking you around the arboretum and back to the starting point. This takes about 35 minutes, including a few pauses to discover the species of particular trees. The path will need attention soon if it is to remain suitable for wheelchairs. The original hard (gravel?) surface has become uneven and hollowed out; in some places it is overgrown with grass. But don’t let that put you off visiting – it’s well worth the effort! It’s been pointed out that the circuit can be exhausting for a wheelchair pusher. There are no severe gradients but it can be a slog along one section: it doesn’t help that the surface has deteriorated. We’ve been around the circuit several times, in both directions. It is definitely easier if you go clockwise because the “steepest” section is then downhill. At intervals you will see seats and totem structures designed, carved, painted and installed in 2005 by a group of creative youngsters on the Guildford Borough Council’s FISH (Fun In the Summer Holidays) playscheme. The youngsters worked with local artist Mary Branson and Adam Owen, trees and countryside manager at Guildford Borough Council. The designs reflect the countries where the trees originated. 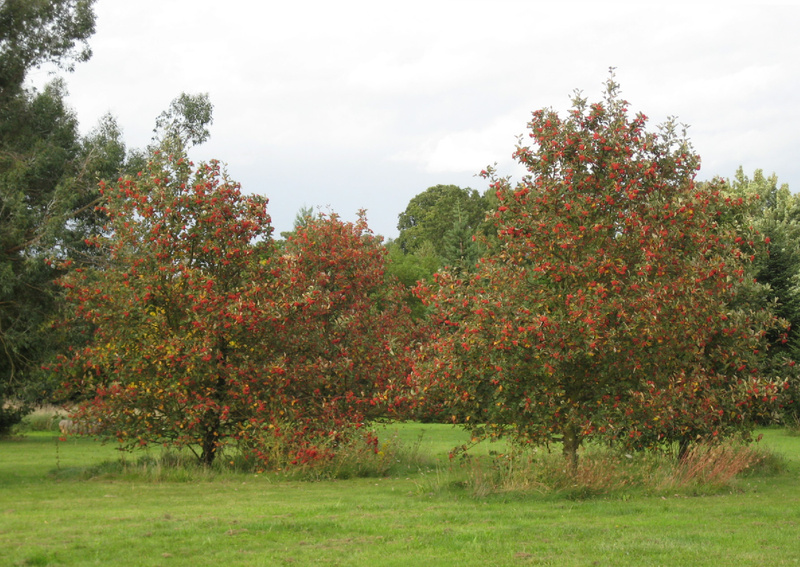 The arboretum’s only negative aspect is the loud traffic noise, due to the busy A3 trunk road which runs alongside. The path length around the Arboretum is 700m (0.44 mile, or 775 yards). 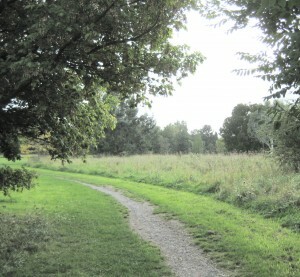 The walk is extended by the distance needed to reach the start of the Arboretum footpath (see below). In Powell Close. There are several parking places at the end of this cul de sac, outside the school: click HERE to view on Streetmap. From the school, take the footpath between the end of the houses and the school grounds. Follow it past the play area to reach a gate at the entrance to the arboretum. There is a short downhill path leading to the information board described above. It is 200 m (250 yards) from Powell Close to the Arboretum footpath. In Manor Way. 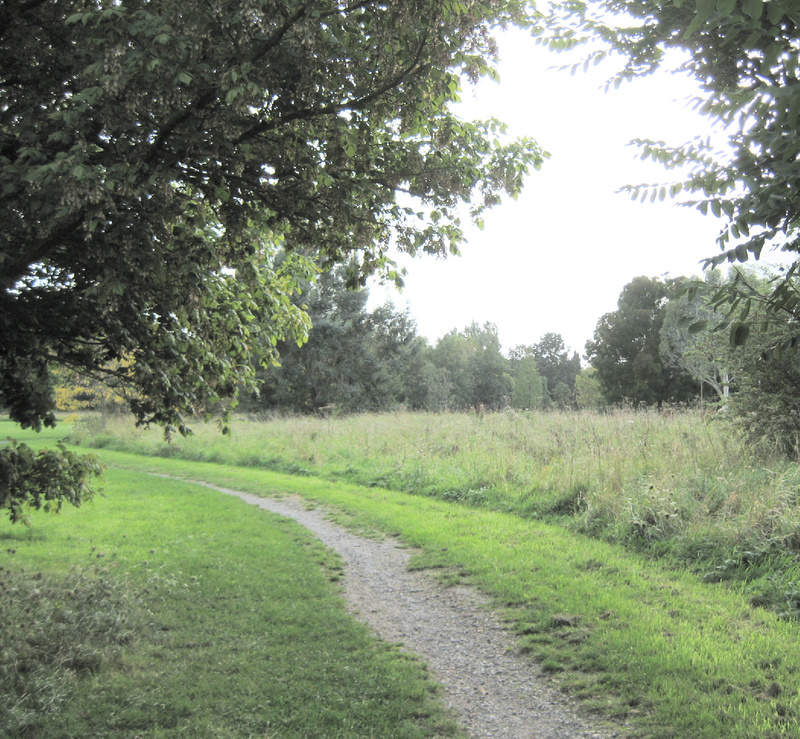 A footpath next to house number 23 leads directly to the Arboretum’s information board, a distance of 100m (110 yards): click HERE to view the path’s starting point on Streetmap. Access from the street is through a gate. Buses: Route 18 (not Sundays) stops in Manor Way near the access gate. Although it also stops outside the shops in The Square (Wilderness Road), this does not provide an easy route for wheelchairs (see below). Warning: path blocked to wheelchairs! There is car parking in The Square at Onslow Village, outside the shops and village hall. But if arriving by car I recommend you park in Onslow Close (see above), not in The Square. Although the footpath with an ascending gradient beside the newsagents runs to Powell Close, metal posts have been installed at two points – to deter cyclists, I presume. The gaps they leave are too narrow to allow a standard width wheelchair to pass. We were able to push my wheelchair through only after folding it. If you find these pages useful please leave a comment. We were delighted to try out around the world in 80 days, a brilliant idea which made an interesting and attractive walk. Thanks for discovering it for us. You might mention there are many informal seats along the path, cleverly carved. It is rather a exhausting push if you have a heavy non walker. Luckily we met some strong young men at the end who pushed my son up to Manor Way at the end of the circuit. Maybe you could devise a symbol for “strong pusher required”. Thanks for your kind comments, Penny. I’ll update the text in the light of your comments. And in future I’ll indicate when a “strong pusher” is required! I hope you’ll enjoy some of the other walks posted here. I’m sure they would be glad of the publicity. I tried this walk out in the autumn of 2014 as I thought the leaf colours would be spectacular. Unfortunately, there was a great storm the night before and most of the leaves were on the ground. You mention the noise of the A3 and that did spoil the walk with my mother. Perhaps it would be better in the summer when the noise level would be covered by the many leaves on the trees!